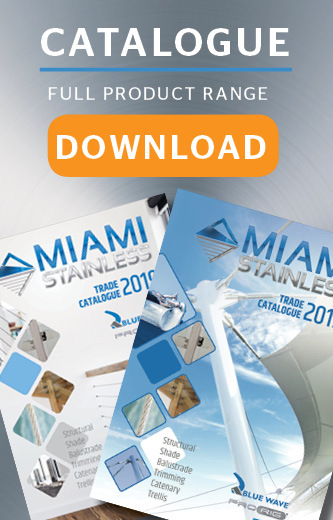 Miami Stainless high quality Dee Rings are available in both AISI 316 marine grade stainless steel and AISI 304 stainless steel. Miami Stainless Dee Rings are a stainless steel ring formed into the shape of the letter D and are made from stainless steel bar with the two ends welded together to complete the ring. Stainless Steel Dee Rings are commonly sewn onto a shade sail fabric edge to enable a connection method between the shade sail fabric and any number of stainless steel connection fittings or tie down points. Other uses for stainless steel Dee Rings eare found in tarps, tents, saddlery, harnesses, leashes and seat belt webbing. Dee Ring 3 x 15mm Stainless Steel AISI 304Miami Stainless Dee Rings are available in..
Dee Ring 6 x 40mm Stainless Steel AISI 304Miami Stainless Dee Rings are available in..
Dee Ring 6 x 50mm Stainless Steel AISI 304Miami Stainless Dee Rings are available in..
Ezi Hold Dee Ring With Eye 5 x 50mm AISI 316Miami Stainless supplies high quality AISI 316..
Dee Ring 3 x 20mm Stainless Steel AISI 304Miami Stainless Dee Rings are available in..
Dee Ring 4 x 25mm Stainless Steel AISI 304Miami Stainless Dee Rings are available in..
Dee Ring 5 x 25mm AISI 316 Miami Stainless Dee Rings are available in both high quality AIS..
Dee Ring 6 x 40mm AISI 316 Miami Stainless Dee Rings are available in both high quality AIS..
Dee Ring 6 x 50mm AISI 316Miami Stainless Dee Rings are available in both high quality AISI 316..
Dee Ring 8 x 50mm Stainless Steel AISI 304Miami Stainless Dee Rings are available in..
Dee Ring 8 x 50mm Stainless Steel AISI 316Miami Stainless Dee Rings are available in..
Dee Ring 10 x 65mm Stainless Steel AISI 304 Miami Stainless Dee Rings are availa..
Wire Support Dee Ring 8 x 50mm AISI 316 Miami Stainless 8mm x 50mm Dee Ring With Wire Support are..